When the 1994 baseball season started, there was only a single MLB stadium whose name could be considered a result of corporate sponsorship (and the company owned the team at the time, so even that is up for debate). When the 2014 season kicks off this spring, fewer than one-third of the stadiums are without a corporate name over the gates. Yesterday, the Texas Rangers announced that their stadium would once again be undergoing a name change after selling off the naming rights to Oklahoma City-based Globe Life and Accident Insurance Company. With that, the number of MLB stadiums without a corporate sponsor sinks to only 10 (possibly 11, depending on how you look at things). Out of curiosity, we looked back to 1994 to see just how rampant this naming rights nonsense had become within our lifetime. As things stand now, there are only 9 stadia of the 30 MLB venues that aren’t brought to you by some company or product — Dodger Stadium (Los Angeles Dodgers), Yankee Stadium (NY Yankees), Fenway Park (Boston Red Sox), Wrigley Field (Chicago Cubs), Nationals Park (Washington Nationals), Marlins Park (Miami Marlins), Angel Stadium of Anaheim (Los Angeles Angels of Anaheim), Kauffman Stadium (Kansas City Royals), and Oriole Park at Camden Yards (Baltimore Orioles). And of those nine teams, two had previously played in branded stadia. In 1998, Anaheim Stadium became Edison International Field, a name it kept until the end of the 2003 season, at which point it took on its new, non-commercial title. Meanwhile the Marlins, then known as the Florida Marlins, played in a stadium that went through numerous name changes in just a few years. When the Marlins started there it was Joe Robbie Stadium, before changing in relatively rapid succession from Pro Player Stadium to Dolphin Stadium to Land Shark Stadium to Sun Life Stadium before the Marlins moved out to their own, yet-unbranded Marlins Park in 2012. We have no doubt that the cash-strapped club would not turn away a big enough offer to slap some bank or insurance company’s name on that new stadium. Twenty years ago, only the St. Louis Cardinals played in a stadium with a corporate name — Busch Stadium — but even that may be an exception to some, as Anheuser-Busch did own the team at that point in time. But following the strike-shortened 1994 and 1995 baseball seasons, a handful of stadium operators and teams began selling off the naming rights to their venues. The Atlanta Braves moved from the crumbling confines of Atlanta-Fulton County Stadium to the venue that had been briefly known as Centennial Olympic Stadium (built for the 1996 Atlanta games) before being named after Ted Turner, who owned the team at the time. The Braves continue to play at Turner Field but will soon be moving to a yet-unsponsored stadium outside of the city. The Cincinnati Reds were playing in Riverfront Stadium in 1994, but that became Cinergy Field in 1996. The team moved to spanking new sponsored stadium, Great American Ball Park, in 2003. The San Diego Padres had called Jack Murphy Stadium (aka San Diego Stadium) home since 1969 before it was renamed Qualcomm Stadium in 1997. The Padres then made the move to Petco Park in 2004. For years the San Francisco Giants shared Candlestick Park with the NFL’s 49ers, but the legendary stadium was briefly renamed 3Com Park in 1995. The Giants would then move to their own waterfront stadium in 2000, going through three name changes — from PacBell Park to SBC Park to AT&T Park — in only six years, as rapid consolidation in telecom and wireless required constant rebranding of the venue. The expansion Colorado Rockies were still playing in Denver’s Mile High Stadium in 2004, but would relocate to the beer-branded Coors Field the next year. When the Arizona Diamondbacks and Tampa Bay Devil Rays (now just the Rays) entered the league in the late ’90s, they came with branded stadia. The D’backs played in Bank One Ballpark, which is now known as Chase Field, and the D-Rays bounced balls off the rafters of Tropicana Field. The Seattle Mariners left their home Kingdome and moved to Safeco Field in 1999, closing out a half-decade of naming rights deals for MLB stadia. The new millennium would see the closing of two of baseball’s most beloved (and a few of its most hated) venues, meaning stadium operators had to decide whether to stay true to a well-known name or cash in with brand-name sponsorship. While Yankee Stadium was replaced with… Yankee Stadium, the Detroit Tigers had no such reverence for the Tiger Stadium name, leaving their longtime home and relocating to the corporate-friendly Comerica Park in 2000. The Chicago White Sox had tried to keep the Comiskey Park name when they opened their new stadium in the early ’90s, but a decade later it was time to make some money off the naming rights, turning the building into to U.S. Cellular Field in 2003. After three decades of playing at Milwaukee County Stadium, it was apparently time for the Milwaukee Brewers to be associated with the city’s most well-known beer company, as the team moved to Miller Park in 2001. In 2000, the Houston Astros left behind the Astrodome and into the significantly upgraded site of what was originally dubbed Ballpark at Union Station before almost immediately being renamed Enron Field after a company that tanked so badly the stadium had to briefly be renamed Astros Field in 2002 before being re-christened as Minute Maid Park. Both Pennsylvania ball clubs ditched their cookie-cutter concrete behemoths in the early part of the 21st century. The Pittsburgh Pirates were first, fleeing Three Rivers Stadium for the bank-branded PNC Park in 2001. My beloved Phillies left the not-very-loved Veterans Park behind in 2004 and walked across the parking lot to Citizens Bank Park. The Cleveland Indians had just moved into Jacobs Field in 1994, and the team managed to wait all the way until 2008 before selling off the naming rights to Flo from Progressive. Likewise, the Toronto Blue Jays are still playing in the same building that was called the SkyDome in 1994. It just got a new name, Rogers Centre, after Rogers Communication bought the team and the stadium. Much like the Busch Stadium of the ’80s and ’90s, you might not consider it sponsorship if the team owner puts its name on the building. Given that there are fewer and fewer stadia to slap a corporate name on — and how some fans would likely revolt if they had to go to games at Gatorade Field at Fenway Park or the Yahoo! Yankee Stadium — we don’t expect too many major name changes to MLB venues in the coming years. That said, in addition to the Texas Rangers announcement, there have been two recent examples of branded stadia. 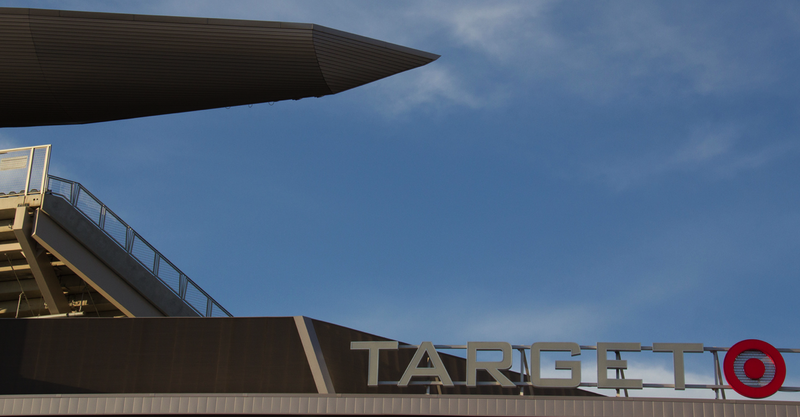 After years of being somewhat sheltered from the elements inside the Metrodome, the Minnesota Twins aligned with a small local retail chain and moved into Target Field in 2010. Meanwhile, the Oakland Athletics’ home continues to roll through a series of name changes. The Oakland–Alameda County Coliseum was renamed Network Associates Coliseum in 1998, then McAfee Coliseum in 2004, then back to Oakland–Alameda County Coliseum in 2008, then finally to O.co Stadium in 2011 in the most expensive effort ever to convince people to use shortened URL for an online retailer.